Notes: [source Dambro Raremaps Dover NH] Issued 1699, Amsterdam by Arnout van Ravestein. Cartography by Sanson et Fils. . Gravier, La Cartographie de Madagascar, 163 (the earlier 1655 state) Tooleys Dictionary of Mapmakers, vol. 4, p. 102-04. not found in Koeman, Atlantes Neerlandici (indeed, no cartographic production by van Ravestein is found). not in Brunet, Tresor de Livres Rares et Precieux. 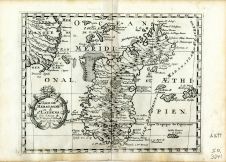 see Phillips, Atlases in Library of Congress, 528 (same source, but issued 1700 by F. Halma and with slightly different author/ title) R10406-R448.